Taste the true flavor of San Francisco. Seafood, fresh from the sea and perfectly prepared, Sicilian delicacies, homemade pastas, seafood risotto and seafood sausage and shellfish cioppino. And yes, the view is also famous. Alioto’s is located at Fisherman’s Wharf. Run by the Alioto family since 1925. An excellent steak, priced fairly, and a friendly and attentive staff make this the best steak option in town. Thirtysomethings congregate at the bar of this hot spot every evening, entertained by a gregarious, storytelling bartender. Frascati is a Mediterranean style bistro, located in one of San Franciscos's most desirable neighborhoods- Russian Hill. Originally opened in 1987 this quaint, tri-level restaurant featues warm colors, high ceilings and street views of cable-cars clanging up and down Hyde Street. With a warm and friendly staff, inventive menu and energetic atmosphere, Frascati is the kind of place that fosters memories. Simply stated, the best burgers in San Francisco. Phenomenal Sushi. Great prices. Need I say more? 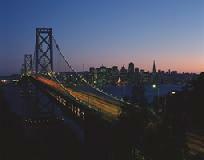 For the taste (and scent) of the quintessential City by the Bay, spend the day at the waterfront. Here, you’ll find the landmark Fisherman’s Wharf, where sidewalk counters offer visual and culinary treats for seafood lovers; vintage sailing vessels moored at Hyde Street Pier; a chocoholic’s heaven at Ghirardelli Square; the great shops and restaurants of The Cannery and PIER 39. The Red & White Fleet offers ferry departures to “The Rock” daily. From 1934 to 1963 this island in the bay was a maximum-security prison housing some of America’s most notorious felons. A marina and waterfront park are part of this two-level complex that offers restaurants, a family amusement center and more than 100 specialty shops. Yes, you can walk (or bicycle) across San Francisco’s most famous landmark. Stretching across 4,200 feet of ocean, connecting San Francisco with Marin County, the Golden Gate Bridge is the longest suspension bridge in the world. Bring a light jacket and prepare yourself for some of the City’s most spectacular views. Of course, you can always drive across, but you’ll have to pay a toll on your return trip to the City. The best views of the bridge are from Fort Point in the Presidio (Long Ave. and Marine Drive) and Vista Point on the Marin side (the north end of the bridge). No trip to San Francisco would be complete without a visit to the City’s “free spirit” — Haight-Ashbury. A siren song of handsome Victorians wedged between the luscious green expanses of Golden Gate Park and the wilder hillsides of Buena Vista Park, Haight-Ashbury (as it was better known in the sixties) still bears the fame — and some of the problems — of its short, intense fling with the hippies. Signs remain, but on the whole, the Haight is a much more gentrified neighborhood nowadays, with new restaurants and bars catering to an upscale clientele. Open daily, 10 a.m. to 6 p.m. Take a close-up look at the whirring cable and other mechanisms inside the powerhouse that runs the cable cars. Part of the Golden Gate National Recreation Area, this coastal redwood preserve features majestic redwoods and scenic hiking trails that draw more than 1.5 million visitors each year. Less than 30 minutes from San Francisco, this is definitely worth thr trip if you want to see the Giant Redwoods. >>Search Pollstar for live music in San Francisco!